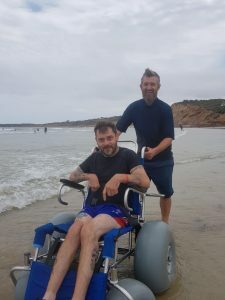 Amazing scenes on the beach at Anglesea yesterday where the Interchange Adult Camp took a group of 14 adults with support staff to experience the fun and excitement of the surf, sun and sand. 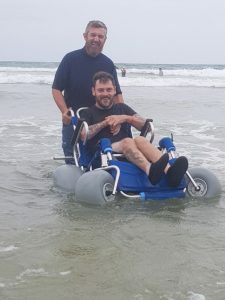 Jye is living with Cerebral Palsy and has never experienced the ocean before. Jye said that he has been to the beach, but was never able to negotiate the sand to get to the water. When Jye nominated to go on this camp, we made it a priority to ensure Jye had every chance to experience the surf. 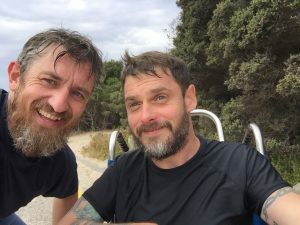 We spoke to the staff at the YMCA Camp where we are staying and they loaned us a Sandcruiser Wheelchair which was perfect for accessing the beach. So, as you can see in the photos, after 37 years, Jye was finally able to get into the surf at a beach. He even made a facebook post himself to celebrate the milestone. Thanks also to Community Facilitator Rob who is working with Jye on the three day camp and the staff at the YMCA Camp in Anglesea.